The sign's that Spring is on the way. Haven’t had much time this week to get up the plot, today I only managed to do 2 hours but in that time I did manage to get a bit more done on the floor round by the compost bins, a few more pallets and it will be done. I also sieved out the ash that I got from the bonfire last week I am going to use it to put round my soft fruit. I did notice that the first signs of spring are now on the way the autumn fruiting raspberries are starting to push through and my recently planted miniature pear tree’s buds are starting to swell. Although there are no sighs of the rhubarb that I planted last September let’s hope they haven’t rotted because of the snow. I have had mixed success with the broad beans sown a few weeks ago, some have turned black and rotted but some have flourished and look almost ready to plant out. I have a few more seeds left so will sow them at some point to replenish the ones lost. I have now managed to get Thursday off work and plan to spend the whole day down the plot as the raised beds wont dig them self’s over! More from the plot then I suspect. if you want to see more pics then take a look at my facebook page there's a link on the right. 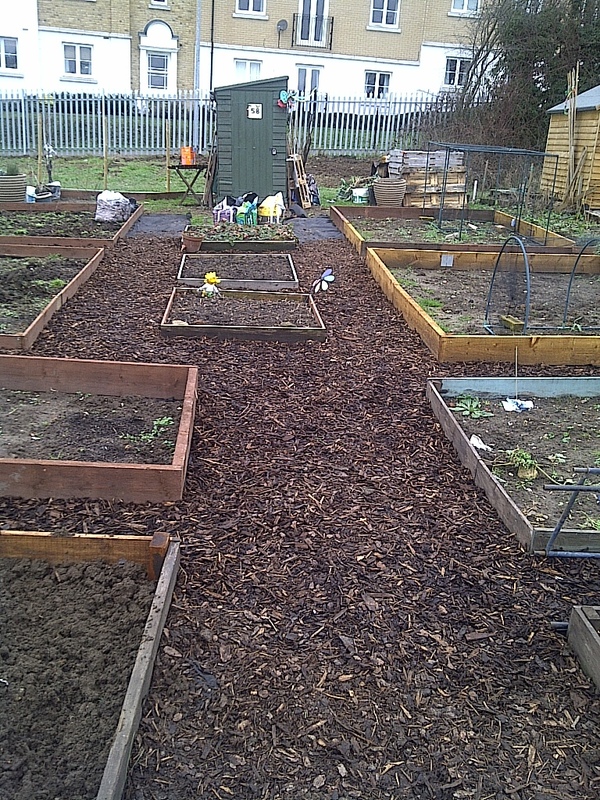 The last few days have been a bit on the hectic side, it’s consisted of allotment in the morning till mid-afternoon then work in the evening till late, but I have really started to get stuck in down the plot and finally got the barking finished and it does look good. On Sunday my father came down the plot to help me construct a new recycling area I already have 1 compost bin but wanted another plus a leaf mould bin I forgot to take a “before” picture of the area but the finished area looks smart. 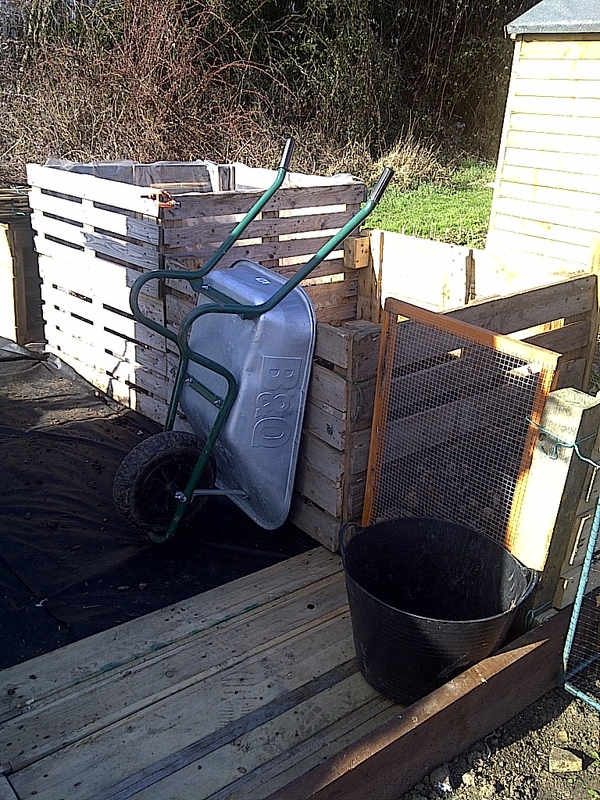 I have also come up with the idea of putting pallets down on the floor in this area to make it more robust for the wheel barrow to move over this is going to take bit of time to finish as I need about 8 pallets and only currently have 2. Yesterday I spent the best part of 6 hours at the plot again with the wife at work and girls at school it was time well spent I had my first bonfire and I got a little carried away with it! (Think it’s a man thing! )I got rid of all the old Brussels that needed disposing of and some off cuts of wood left over from making the raised beds. 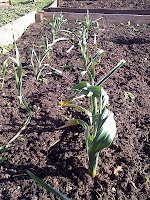 As far as crops go my garlic is looking rather healthy considering the snow looks like I am going to have a good crop this year. There isn’t much left now in the beds just a few Celeriac and some Cavalo Nero oh and a random parsnip I dug up when I was digging over a bed!I was pleasantly surprised with the compost from the bin as well it looks really rich and moist and by the looks of it will have about 20 wheelbarrow full of it think my vegetables are going to love it. There is one low point my potatoes that got a bit of frost have all but rotted I have about 3-4 left of each variety so my planned experiment with them all won’t be as high yielding as I hoped and the plan now is to grow them all in containers on the plot and buy more potatoes to put in my potato patch. And will have to try it again next year. There are more pictures on my Facebook page if you want to have a look just click the link on the right. Well the weather has been a bit kinder this week and I have managed to get down the plot a few times between work and home life. The Barking of the plot is still continuing but this is a few weeks from being completed but what is done looks pretty smart if I do say so myself!. 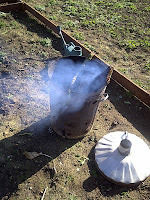 The next job on my list is construction of another compost bin I have one already but need another to turn the compost and aerate it. I have 4 pallets acquired from a local factory that were happy to get shot of them. I was breaking of the bottom bits of the pallets to make them flat and the regular hammer was doing the job but taking an age and not to mention it was hurting my wrist with every strike. 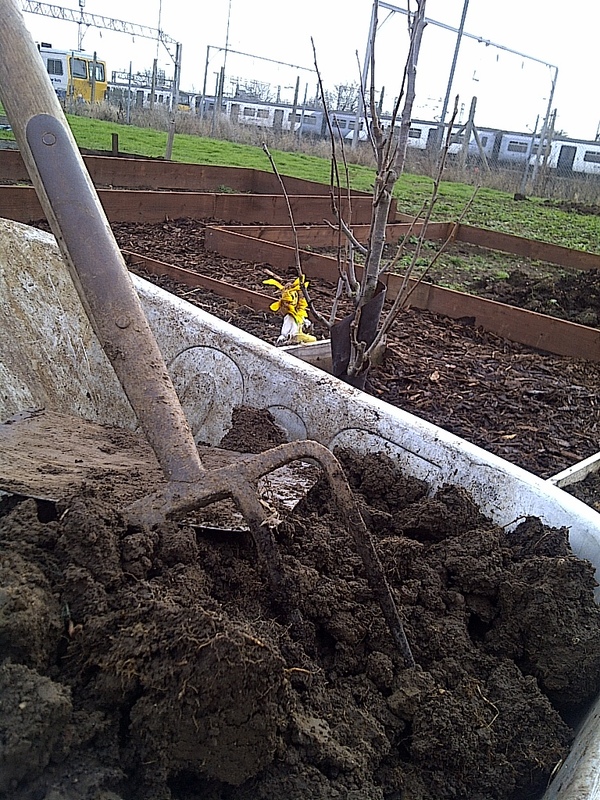 Time for a brew I thought and the new plot holder opposite was down the allotment so I offered him a brew so the ice was broken we got chatting and when I got round to explaining what I was doing he went back to his shed and out he walked with a sledge Hammer! (Who keeps a sledge hammer in there allotment shed? )I was taken aback by this but it did make short work of the pallets. I also made a metal note not to cross swords with Number 52! 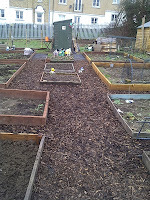 Hopefully by Sunday lunchtime the compost area will be upgraded I will post some before and after pics. 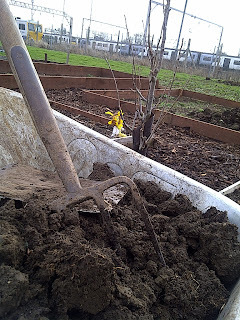 I also got round to planning the Pear Tree as the soil was surprisingly dry still. Won’t be long now until it will be read to take some onion sets. I am devastated. My seed potatoes which I thought were in a frost free place got attacked by frost over the weekend. It must have been the -9 we had on Saturday night but all my 10 variety’s growing for my potato experiment have all fallen fowl in some way. The worst of was my Ryecroft purple I lost 5 of them. All those that know about my potato trial will be aware that I had 9 different varieties from JBA seed potatoes all with just 10 tubers so when I lose 5 out of 10 that’s a big loss. All in all I lost 27 out of the 90 I had so I can still work with that but I am going to have to buy a few more to add to my stock so I have some substantial crops. This is my 7th year growing potatoes and it’s the first time I have ever had this problem. 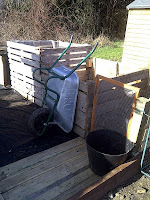 May be because I am using such old variety’s they need more attention…oh well that’s gardening for you! You win some and you lose some. When I think of comfort food I think of soup, yes, yes I know all you women out there are now saying not a chance it has to be “CHOCOLATE” but there is something about soup that makes everything feel alright I think it must stem form when I was younger as my mother always gave me soup when I was unwell and after you ate it you for a brief moment felt better, something that I still do today. I even find making a soup to be quite therapeutic I think it’s because I know “everything will be ok” after I have eaten it. Simple soups are what I love soups that do the ingredients justice my absolute favourite is Leek & potato soup. So today when I was making it for my wife and me for lunch it really got me thinking that it’s the ultimate Allotment recipe, what better to show case your plot over the 4 seasons that soup. Can you think of something better? I Challenge you to. Something that is purely made from what you grow, in fact next summer I am going to make a soup on my plot I have a camp heater that I use to make a brew on the plot so all I need is a saucepan. I thought I would also share a few tips and little helpful points on the favourite are of a good soup. · If your soup turns out runny and not as thick as you want it rather than reach for the corn flour why not just add a spoonful of rice and cook that in your soup this will release its starch as it cooks and thicken you’re soup then just blitz it in which your soup you won’t notice it in the end soup. 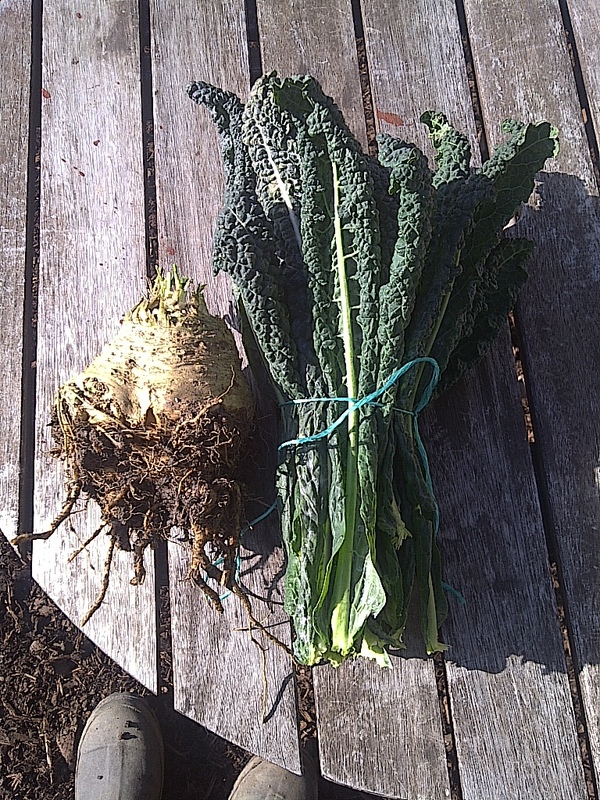 · Another top tip when making a soup NEVER BOIL your ingredients this will not release all those wonderful flavours from your veg simmer is the key. Well its day 8 of my holiday which I took to get some jobs done down the allotment and so far because of the weather I have spent a total of 3 hours there, so today after the wife went to work and I ran the girls to school and pre-school I found myself with a few spear hours but couldn’t go to the allotment as the snow is still quite bad in Colchester I had to do something I was getting withdrawal symptoms! So I pottered in my shed for a while then decided to sow some tomato, Aubergine & parsley seeds. I have grown Aubergine’s before but not from seed I normally pick one up from the garden centre as a small plant. Every year now when I grow tomatoes I always go over the top and grow 6 or 7 types but this year I have decided on just 3 types the reliable Gardeners Delight , Alicante and San Mirzano 3 a plum variety that way it covers it all with a plum for cooking and 2 salad variety’s. This is the earliest I have sown tomato seeds I normally wait till mid-march but this year the thought was this would extend the growing season as I could plant them in May when they were about to fruit. Rather than have to wait till mid-June before any. I plant outside for the allotment and I have a greenhouse at home and grow in there as well this year I am going to grow the Aubergines inside and out as they normally stay in the greenhouse and see what produces best. Parsley also benefits from an early sowing this will give it chance to establish and form good size plants. I love parsley it’s one of my favourite herbs it adds a splash of colour to a dish or if used right add a distinct flavour to a good soup. It also I find planted in with your carrots helps deal with carrot fly. I did it last year and didn’t have any, so I will be doing the same again this year. Hopefully the snow will clear buy Thursday and I can finally get up the plot. well like the rest of the UK today I awoke to see a blanket of white which as a gardener this isnt much fun I am chomping at the bit to get down the plot and and get stuck in. there is so much to do to get things ready for the new season. lets hope it clears soon................I'm off for a Coffee. 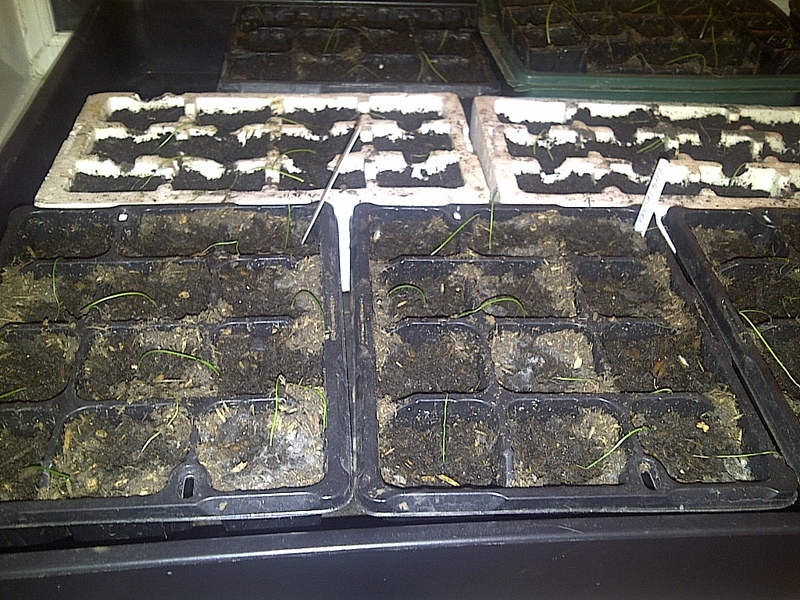 Onion Seed V Sets Part 2. 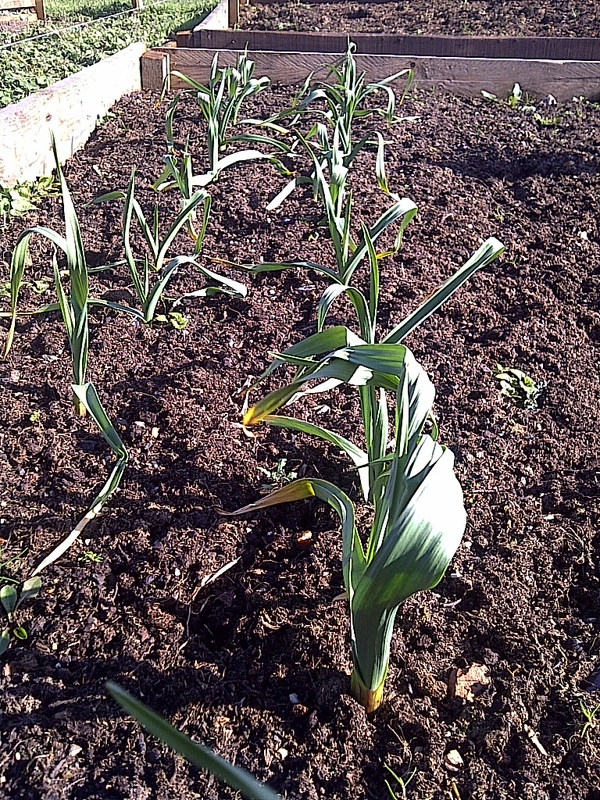 Oh dear oh dear the onion seeds are not doing particularly well due to the intervention of my 3 year old daughter. I have my onion seeds sitting nicely on the Bathroom window sill soaking up all the sun throughout the day. My youngest thought the onion seeds needed water….lots of water…..in fact during “bath time” the other evening they thought they were in Asia at the height of monsoon season when I went in to get here out the bath she said to me “Daddy, I watered your seeds like Mr Bloom” (for all those unfamiliar with Mr Bloom he is a character from CBeebies all about growing vegetables) I couldn’t be cross with her because she was only trying to help me I suppose and she looked so cute when she said it too. When I looked at them they were actually swimming in water I did my best to remove all the water I could but since then the seeds have all just rotted off and all but 1 has died. So yesterday whilst out at my local garden centre I picked up another packet of onion seeds and also as a back-up measure I brought some seed onions Centurion, I hope I have more luck this time round with the onion seed because before the “monsoon” they were not looking to healthy anyway. I have also been sowing some parsnip seeds this week in individual modules as they take an age to germinate, it has also highlighted to me that I need to invest in a greenhouse heater as I am slowly running out of window sills to put things on.